Leading internet casino game developer Play’n GO has announced the release of a new online slot game titled Legacy of Egypt. 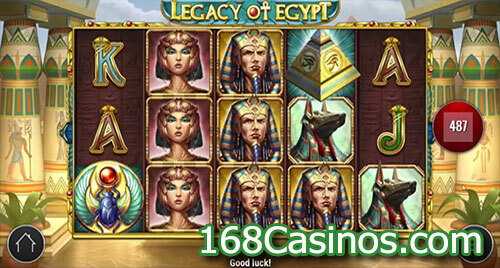 The 5 reel and 30 pay line Legacy of Egypt online slot takes players back to the time of pyramids and gives them the opportunity to try and win a Pharaoh’s gold in the process. The new slot game is playable from 30p to £90 a spin on all devices including tablets and smartphones. Legacy of Egypt comes with a Free Spins feature where punters can play with a multiplier of up to 10x as well as trigger the Pyramid Spins feature where they are offered more free spins with a fixed multiplier of up to 10x. The most valuable symbol is the Pharaoh giving 10x players’ stake for 5 across a pay line. The Wild symbol is the Scarab that replaces all symbols with the exception of the Pyramid Scatter and pays out 16.66x players’ stake for 5 on a pay line. Three or more Pyramid Scatter symbols will trigger the Wheel of the Gods feature where players come across a spinning wheel which determines how many free spins they get. Two Wild Scatters during a free spin activates the Pyramid Spins feature while three Wild Scatters on a free spin will also trigger the Pyramid Spins feature but with double values on the Wheel of the Gods. Players have a chance of winning payouts of 5,000 their total stake on every free/Pyramid spin with a 10x multiplier.